Isn’t it incredible that something as simple as lighting some candles in your home can change every thing. Suddenly the frenetic life that you have been living seems calmer, reminding you that your home really is your sacred space. And so when you do decide to take the road more chilled, it’s best to look for the finest bees wax candles and candle holders from Queen B’s Black Label collection. Queen B’s beeswax candles are made with 100% pure Australian beeswax, a pure cotton wick and a copious amount of hand made love. Beeswax is a natural ioniser, purifying the air of dust, pollen, odours and toxins, so these aren’t just beautiful, sensual products, they’ll also make your home cleaner and smell sweeter, the air you breathe will be healthier and you’ll be nurturing our environment too! And with the Black Label collection, you know you have the best of the best. 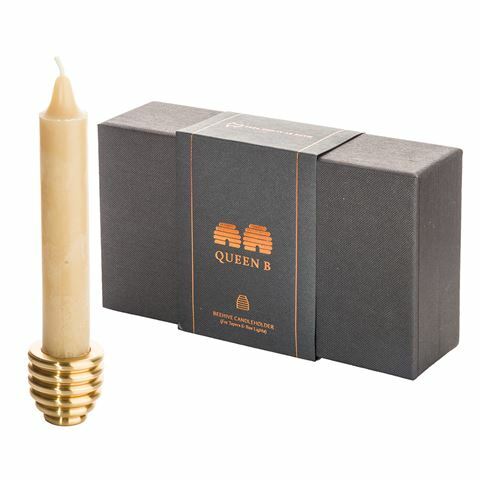 This exquisite, solid brass Reversible Beehive candleholder is designed to hold a Bee Light candle in the top of the hive, or turn it upside down and pop a taper candle in the base. Either way, using the shining brass, curved candle holder and whichever candle you choose, will look glamorous in any space. Handmade from 100% Australian beeswax with pure cotton wicks. The Reversible Candle Holder is made from solid brass. The pack also contains a medium sized beeswax candle. All candles are natural, with no added fragrance and are nontoxic to burn – just as mother nature intended! The beeswax candles will not smoke or drip, and the wicks won’t drown in their own wax. Burning Queen B candles helps support Australian beekeepers, the environment and the talented artisans who make them. Contains no paraffin, no soy or palm wax. Presented in a beautiful Black Label Queen B gift box. Box Dimensions: 19cm (l) 5cm (h) x 10cm (w).